Review: WOW! This book was GOOD! For some reason, when I first read the summary I was turned off. I don't know why. But when I had the chance to go to a private Q&A with the author, I figured I should probably read her book. I'm so glad I did! An upfront warning: this book is totally predictable. Totally. As in, you'll see the major twist coming pretty much from the beginning. Does that take away from the good-ness of the book? Not at all! One of the things I loved about this book is that, even aside from being sci-fi, Marissa wasn't afraid to make the fairy-tale her own. This book isn't predictable because it follows the original/Disney Cinderella. She has so many more things that make it unique. Moon-people with "magic" powers, a robot helper (instead of mice), and a stepsister who actually likes her! So fun! One of my pet-peeves is when fairy-tale "retellings" are SO close to the original story that it's a stretch to call them a "retelling." Marissa does a great job incorporating the sci-fi elements into the story. She doesn't bog you down with egregious details on how the different mechanics work, but I believe all the tech she does describe. It was also easy to like the prince. There was no insta-love, and Cinder certainly isn't one to swoon, but there certainly was some chemistry going on there. Literally. All-in-all a really great read, and I'm so excited that the next three books already have titles and release dates! 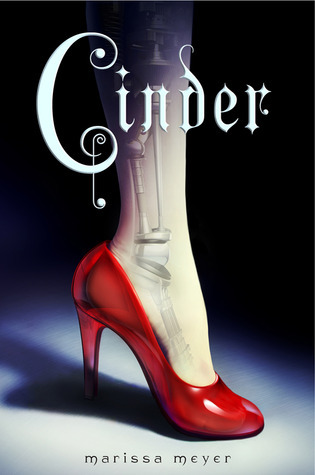 All of the books will star Cinder as the main character, but will also share a POV with another fairy-tale heroine. Scarlet (2013) will take place in France with Little Red Riding Hood, Cress (2014) will take place ON THE MOON with Rapunzel, and Winter (2015) will take place in the Sahara Desert with Snow White. Cool, eh? Clearly the publisher sees some pretty serious talent in Marissa if they've already taken her on for FOUR books in FOUR years. And I don't blame them. She rocks, and so does Cinder. I agree! I liked how she changed little details in the fairy tale to make it her own. My favorite is the orange clunky car that she fixes up. :) The characters were so fun. Iko is adorable. I loved this book! I love that more and more retellings these days are turning away from the classic fairy tale setting. This looks like it's definitely going to make it big. Wanna know something sad? I didn't even know the car was orange until you said that. What a cool parallel to the pumpkin carraige! I must have skimmed that detail. So now I know who Marissa Meyer is. I just had a spaz attack!!! I did NOT know that's what they were going to do with the other books. That's SO cool!! Hmm... I wonder if the girl that warned Cinder of the Queens plan is one of them. Good Lord, I can't wait. I totally agree, the twist is predictable, but that doesn't take anything away from the experience. Great review! I'm so glad that you liked this one! I really enjoyed it too. And I agree with Marissa that a lot of the suspense is built in Cinder figuring out what is going on around her, even when the reader already knows. I love your review! Your completely right! I saw that "big reveal" coming from page 1 but something still kept me interested. I ended up absolutely falling in love with it! I too ADORED this book. It was on my 'Best of 2011' list! I didn't know that she had already scheduled and named the sequels, though - that's totally awesome! Can't wait to read more! Also: great review. I agree with you on seeing the 'twist,' but heck, it's a fairy tale! We know how it's going to end. *grin* Hopefully. Oh goodness, I keep reading reviews like this and I haven't read it yet and gee, I just wish there was more time in the day for books! Great review! Like you, we found the book predictable, but that just meant we weren't reading for the WHAT, but rather the WHEN and HOW and WHAT NEXT. It totally worked, and speaks to the author's talent in writing and characterization. Oh, boy, I keep seeing great reviews about this book (this one included - so great) and I feel this need to read it like.. right now.